If there’s one thing I really love to see when it comes to wedding cakes it’s a cake that doesn’t take itself too seriously. After all, your wedding day should be filled with fun and smiles so why not add a touch of whimsy to the cake table? Take today’s cake as a perfect example – it has a fun carnival theme and a super cute cake topper to boot! This cake would be perfect if you’re planning a fun, outdoor reception. You could play with the “carnival” theme and add some other fun desserts to the celebration. 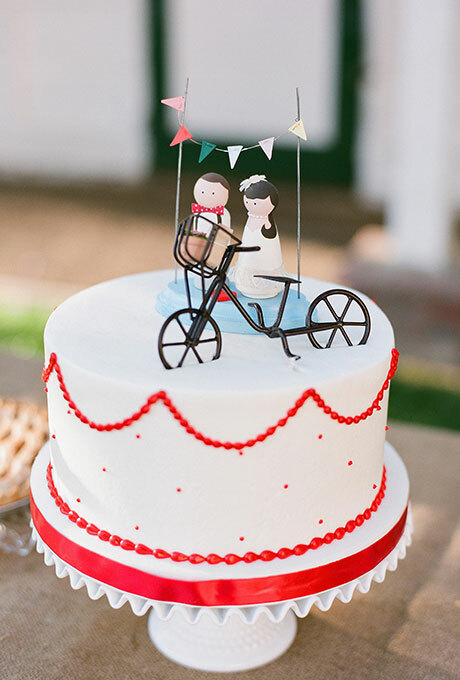 I love this single-tier white cake thanks in part to the bright pop of red adorning the cake and the cute cake topper that includes a bicycle and cute figurines. You’ll find this cake here. It was created by Beverly’s Best Bakery.